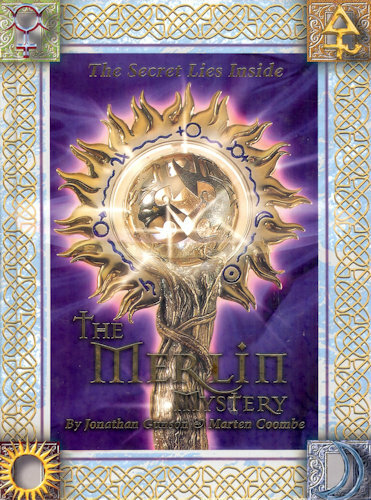 The Merlin Mystery by Jonathan Gunson and Marten Coombe was published in 1998. This was the second armchair treasure hunt book I discovered after Masquerade. Unlike Masquerade, I found it when it was new, just as the three year countdown for solving it started ticking. Of course I bought a copy straight away. Certainly the book sets its stall pretty plainly, with its gold enlaced cover and its promise of a pot of gold and a garish gold wand for a clever winner. Rather than a buried treasure, the wand was safely locked away in the vaults of the Bank of England and solutions were to be mailed in. Its astrological and chemical symbols immediately appealed to me and there was some fun to be had spotting patterns and linked figures. In the end, however, I’m a bit indifferent towards the book. The artwork isn’t anywhere near as good as Masquerade, being a chaotic jumble of cartoonish art plastered with computer generated and photoshopped symbols that is in no way pleasing to the eye. The story is readable enough but formulaic and forgettable. But it caught the imagination of enough people at the time that several international teams tried, and failed, to solve the puzzle within the time limit. The deadline passed without a correct answer being mailed in, and so the wand was reportedly auctioned off and the proceeds given to charity. An official solution was published shortly after the 3 year time limit expired and can be found on various Internet archives if you search for it. However, the official solution fails to explain the puzzle very well, and the puzzle is so complicated that many people could be left none-the-wiser from reading it. I have written my own solution to the puzzle and am gradually publishing it on this site. Read my Merlin Mystery Solution. I hope my solution will be of use to people who own a copy of the book and want to understand it better. If you want to pick up a copy to follow along with my solution, they can usually be picked up cheaply on Amazon.